This year’s annual sports day was held on the 29th March 2019 at the Main campus sports grounds. Both staff and students participated in the various activities that included athletics, rugby, volley ball and football. CAVS was represented by staff and students. The Chairman of DFSNT, Dr. Abong’ won two gold medals in 100 and 200M races that he celebrated with team CAVS. The pilot plant played a host to Fr. Heeran Girls High School from Tala where the students were taken through the courses offered within the department before being shown around activities carried out within the plant Aspects of value addition and transformation of raw materials to finished products. This activity which took place on …….was quite interactive and informative, it generated a lot of discussion from the visitors. The Chairman, Department of Food Science, Nutrition and Technology (DFSNT) held a progress/consultative meeting with postgraduate students who are currently pursuing PhD and masters’ programmes. The meeting that took place on ………delved into the challenges faced by the students, major hindrances to students’ progress and milestones that need to be met by each group of students. The meeting concluded that both students must do their part to ensure studies are completed in time. The Ag. Dean, Dr J Mburu and Departmental Chairs including Dr. G Abong' of Food Science, Nutrition and Technology held a meeting with Prof Jose Cisneros on 6th March 2019 to discuss collaboration. The team agreed to explore available avenues. Department of LARMAT participated in CAVS open day which was held on 8th and 9th March 2019, at College of Agriculture and Veterinary sciences, UoN The department has two sections. Range management and Soil sciences. In LARMAT we advocate that “all flesh come from soil” The department deals with teaching, research and consultancy on agro-ecological ecosystems, Range Management, Dryland Resource Management, land and Water shed Management, Management of Agroecosystems and Environment. Soil Science, Soil Physics, soil chemist, biofix fertilizer research, identification of plant species (taxonomy and herbarium), agro forestry, analysis of animal nutrition as well as pasture improvement. The department has two (2) Bachelors’ degree programs, six (6) Masters and six (6) PhD degrees. Mr. Michael Bolton Onyango was attached at Ol Pejeta conservancy. Between 10th July 2018 and 21st September 2018, I was privileged to take part in pasture monitoring, Lion tracking as well as monitoring of other animal species in Ol-Pejeta Conservancy for my industrial attachment to inform various decisions including livestock keeping practices and tourism in Ol-Pejeta. Lesson learnt: Maintenance of healthy, resilient biodiversity in the different ecosystems alongside commercial use of resources for livestock keeping and tourism is key in Kenyan rangelands. It was an awesome experience, out in the wild, watching the wild animals and breathing fresh air. “With passion in travelling, serving the community and nature, you are good to go!” Says future conservationist/ researcher, Mr Michael B.O. Dr. SM Mureithi the founder of Watershed Hydrology Research Lab, Department of Land Resources and Agricultural Technology (LARMAT) and Benjamin Nyilitya, a PhD student and a Water chemist with the Ministry of Water and Sanitation participated in the INMS East Africa Demonstration Site inception workshop at Imperial Hotel, Kisumu, Kenya on 5th and 6th March 2019. The workshop is aimed at improving the understanding of the regional N cycle and investigate practices and policies to maximize sustainable production of food, goods and energy while reducing negative impacts of reactive nitrogen on the environment and human health. The workshop will also focus on task force development for the priority issues for the site. The Workshop was organized by International Institute of Tropical Agriculture (IITA), in conjunction with the Lake Victoria Basin Commission (LVBC). Dr. Oscar K. Koech, from the department of Land Resource Management and Agricultural Technology (LARMAT) and Dr. Ambrose Kipyegon and Dr. Tequiero Okumu Abuom and Jane Kamau from the Faculty of veterinary Medicine attended the student competition presentation on one health approach in combating antimicrobial resistance on 2nd March 2019. This was an exciting opportunity where students in the College Of Agriculture And Veterinary Sciences were able to demonstrate inter disciplinary approach and innovation as a key component in addressing the global challenge of anti-microbial resistance. The students presented as a team from different faculties (Faculty of Agriculture and Faculty of Veterinary Medicine) and different departments, which was also among the evaluation criteria by the judges (Dr. Oscar K, Dr. Ambose K and Miss Jane K.
Dr. Oliver Wasonga and Dr. Oscar Koech from the University of Nairobi (UoN), Department of Land Resource Management and Agricultural Technology (LARMAT) on participated in the stakeholder’s consultative forum for the National Rangelands and Pastoralism strategy being developed in Kenya. It took place from 26th -27th Feb 201at Bomen Hotel, Isiolo. This process was initiated during the national rangeland policy dialogue held in 2016 that established that there are various policies relevant to Range Management, However, strategies to operationalize the policies were lacking. As a result, a workshop held in June 2017 produced the draft Rangeland Strategy of 2017 which highlights many issues and frameworks necessary for providing guidelines for sustainable interventions in the Rangelands. Four Range Management students (Jemmimmah Omondi James Mema, Felix Odegi and Naomi Nzilani,) participated in the removal of invasive alien plant – Parthenium hysterophorus at the Hyena Dam, Nairobi National Park on 9th February 2019. The exercise had been organized by the Friends of Nairobi National Park (FoNNAP) for its membership. The park is currently under serious threat from Parthenium hysterophorus which is allelopathic and so it competes major wildlife pastures and forage. Increased growth of P. hysterophorus is as a result of extensive activities within the park such as Standard Gauge Railway construction, frequent maintenance of the access roads and frequent traffic of tourists due to its proximity to the capital city of Kenya. The FoNNAP team currently considers manual extraction of weed as the only available option since chemical control is prohibited at the Park while biological control will only happen after control trials and approvals passed by government. The students were led by Dr. Staline Kibet a lecturer in LARMAT ,College of Agriculture and Veterinary sciences. Ms Carolyne Kyalo participated in the recent completed second of three planned sessions on Grant Proposal Writing Training held from 20th to 22nd February, 2019 at Chiromo Conference Centre, University of Nairobi. The trainings seeks to impart appropriate skills to faculty members and PhD students. The training was facilited by the Ag. DVC (Research Production and Extension), UoN, Prof. Madara Ogot. In his actual sediments, Grant proposals are different from academic proposal and the heart of proposal writing is how activities are framed. Anyone competing for proposals writing must have unique, innovative and creative ideas. Funds are driven to good ideas!! University of Nairobi’s researchers (Stephen Mureithi, Cecilia Onyango, DaselKaindi, Jane Mutune, and Esther Kanduma) completed a postdoc training on translating science to policy in 2018, facilitated by ILRI with funding from AgriFoSe2030 Programme. The main objective of the ILRI/AgriFose training initiative was to enhance the capacity of recent PhD graduates to undertake policy relevant research and analysis and disseminate their work to the policy making community in support of agriculture and food security in Kenya. As part of creating a network of young scientists doing research for policy, the first cohort trainees are offering similar training to a second cohort of postdocs from the University of Nairobi using the knowledge they gained from the training by ILRI. The first training Workshop for the Second Cohort was held at the College of Agriculture and Veterinary Sciences on Thursday 14th February 2019, from 9am-5pm. The Associate Dean FOA, Prof. Rose Nyikal, Chairman Department of Land Resource Management and Agricultural Technology (LARMAT), Prof. Geofrey Kironchi, and Dr. Oscar Koech, a lecturer in LARMAT and Industrial attachment coordinator in the Faculty of Agriculture, on on 29th Jan 2019 hosted a discussion with visitors from Acre AFRICA, Mr. Ian Kopar Oduk, Portfolio Manager, and Mr. Stephen E. Vick, the head of procurement, Quality Control and Product development, and Jane N. Kamau, Quality Control Assistant from African Coffee Roasters (ACR). 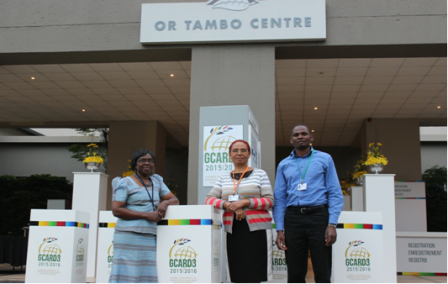 Mr. Stephen and Ms. Jane had visited the UoN to firm up on collaboration in areas of research, training and outreach. These initiatives will strengthen the need for UoN and industry linkages that is needed to ensure quality training and offer experiential learning students and job opportunities. The meeting agreed to develop a Memorandum of Understanding (MoU) on the collaboration between the two organizations. Dr. Oscar Koech from the University of Nairobi (UoN), Department of Land Resource Management and Agricultural Technology (LARMAT) from 20th to 27th January, 2019 participated in the development of skills based curriculum for Ranch Supervisors, Ranch Foreman and Ranch Herder organized by The National Industrial Training authority (NITA). The participants in the workshop developed the National Operation Standards (NOS) for the same skilled professionals. The curriculum was developed with the identification of Ranching and livestock production in the rangelands having great contribution to employment creation, significantly contributing to the Agricultural GDP. Rangelands form a significant proportion (over 80%) of total land mass in Kenya that should be exploited sustainable and provide safe products to the population. The developed curriculum aims at ensuring livestock production is done in a professional way, while conserving the environment and observing the food safety standards. Management and Utilization opportunities and challenges” The workshop was supported by the recent Global Challenges Research Fund (GCRF), which is a £1.5 billion fund announced by the UK Government to support cutting-edge research that addresses the challenges faced by developing countries. The present supported project on mezquite seeks to address the following thematic topics: global health and wellbeing; food systems; resilience to environmental shocks and challenge; migration and displacement; clean air, water and sanitation, and affordable, reliable and sustainable energy. A new network run by AgriFoSe2030 and International livestock research institute, ILRI, aims to develop a pool of policy analysts to sustainably support the development, implementation and evaluation of polices for enhanced agricultural transformation and food security in Kenya. In Kenya and most of Africa, efforts to fight poverty, end hunger and spur economic growth inevitably revolve around the agriculture sector. There is need to support the development of institutional and human resource capacity to support Kenya’s agriculture sector with high-quality policy analyses and knowledge products in a sustainable manner to improve policy making, monitoring and evaluation and learning. AgriFoSe2030 and the International Livestock Research Institute (ILRI) are implementing an initiative to contribute to efforts to address the human resource capacity challenge. The aim of the initiative is to develop the capacity of recent PhD graduates to undertake policy relevant research and analysis and disseminate their work to the policy-making community in support of agriculture and food security in the country. This entails implementing a blended learning approach tailored to the context of the young scientists, emphasising ‘just in time’ and ‘on the job’ learning involving mentoring, coaching, advising, and networking. The Initiative has several participating scientist within University of Nairobi. In LARMAT Dr. Stephen Murethi leads the team. From 2013 to 2018, the German Ministry for Education and Research (BMBF) and the German Ministry for Economic Cooperation and Development (BMZ) have been funding German – African Research Networks to address possible ways and develop promising strategies and practical solutions to strive for global food security within the funding initiative GlobE. 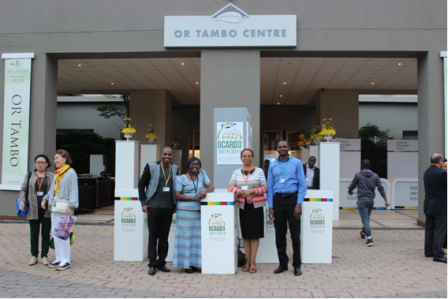 The GlobE research networks have been operating in different regions in Africa and each coordinated by a German lead organization. Reduction of Post-Harvest Losses and Value Addition in East African Food Value Chains (RELOAD) is one of the GlobEresearch consortia. The project brings together partners from Germany, Kenya, Ethiopia and Uganda, and is led by the Institute for Agricultural Engineering at the University of Kassel in Germany. In Kenya, one focus of RELOAD is on pastoral meat value chain (sub-project 6), which is led by the University of Nairobi. 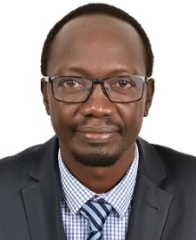 Dr. Oliver Wasonga is the principal investigator of workpackages 4 and 5 under RELOAD’s sub-project 6. Prof. Margaret Hutchnson the Chairman department of Plant Science and Crop Protection signs a PC contact with the Principal College of Agriculture and Veterinary Sciences, during CMB retreat. Prof. Kimenju, Dean Faculty of Agriculture steps forward to give his speech. we welcome you all to discover new knowledge! On the Left is CS Environment Prof. Judi Wakhungu and Right is Primcipal CAVS Prof. Kiama, after a successful ahnding over of meteorological weather instruments to the College. Professor J.H. Nderitu and other scientists spearhead collaborative research on insect pests. Students of BSc. Microbiology and Biotechnology poses for a photo during 55th Graduation ceremony. Principal CAVS poses for a photo in his office after short welcoming the teachers and class representatives from Gatugi Girls Secondary school, during their visit to the college. These are PhD students from different disciplines offered at the University, graduating during the 55th Graduation ceremony. A visit to SEMIs by Departmental members. It was a great friday and something that no one would want to miss for anything next time. It is estimated that 1.3 billion tons of the food produced for human consumption is lost or wasted before it reaches the consumer. This represents 30% or one third of the total food produced. Fruits and vegetables alone contribute 44% or (~572,000,000 tons) of the total losses. There is a call for action to reduce these losses across the world and there are several global initiatives to towards this goal. It is against this background that the special seminar titled ‘Postharvest Technologies for Reduced Postharvest Losses’ was organized. 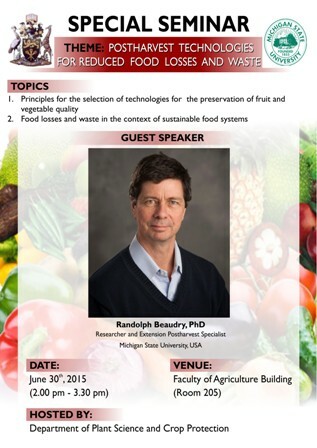 The seminar was held at the University of Nairobi (UON), Faculty of Agriculture Building on 30th June, 2015. Potato breeding at KARLO, Tigoni. Seed production in your own land will require the following soil testing, sampling and crop care. 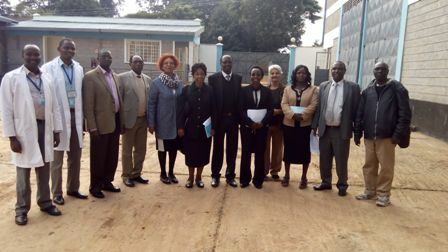 UoN Council, Led by the Chair, Prof.Julia Ojiambo and The University Management Led by the Vice Chancellor Prof. Peter F.M Mbithi Visited CAVS and toured the facilities.The Council is committed in serving the University of Nairobi to achieve world class status in Inovations and Entrepreneurship. University of Nairobi Corruption Prevention Committee (CPC) in Collaboration with the Ethics and Anti-Corruption Commission held a Sensitization Workshop at CAVS. The staff were sensitized on the the corruption prevention in the public institutions;Tools and Strategies,Role of CPC in mainstreaming anti-corruption initiatives.